Those with vision problems will like OS X because it provides an array of features to make using it more comfortable. Visually-impaired Mac users can change the default sizes of on-screen print, and use the keyboard and mouse to give computer commands. You control most of these features from the Universal Access window in System Preferences. When you click on the Universal Access icon, you see the Seeing pane, where you can control features that aid people who have trouble seeing. Note that the pane appears in large type to avoid the problem where someone with limited vision can’t use the tool to increase the type size because the tool’s type size is too small. VoiceOver: This pane turns VoiceOver on or off and can send you to the VoiceOver setup utility. Zoom: When you enable the handy Zoom feature, you can magnify the screen by pressing Command+Option+=. Pressing Command+Option+- (Command +Option+hyphen) reverses the magnification. Display: In this section, you can change the screen from black on white to white on black, if this helps. Move the slider to adjust the contrast, if you like. 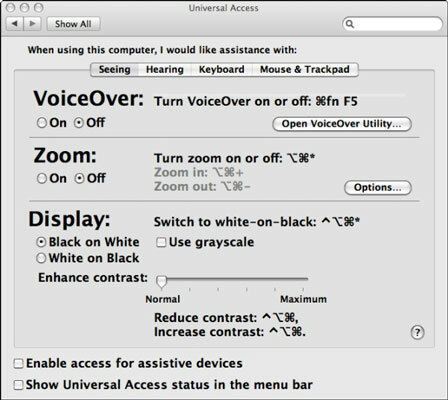 Enable Access for Assistive Devices check box: Selecting this check box enables your Mac to work with a variety of assistive technologies and software packages that are designed to help users with special computer-use needs. For more information, see the Macintosh Product Guide.